A lot of the times we forget how important it is to measure the Return on Investment (ROI) for the things we do. We invest time, money and energy into nice-to-do activities which make us feel like we are busy but they are just activities. They don’t contribute to whatever goal we are trying to achieve. And, a podcast definitely falls into this black hole at the best of times. Creating a podcast that is centred on your passion makes it so easy to forget why we are putting all our time and energy into it. So, this article is written for those of us, especially me, who often forget that we are running a business and get caught up in the pure joy of the process. Whenever we create our free content the most obvious source of revenue is to get someone to pay you money to display their message on your content. Now, advertising has changed massively over the last decade and the next 5 years are not going to be any different. The added advantage of having a podcast is that you can get a company on board that values the people who are tuning into your show. There are very few mediums out there that can target customers the way a podcast can, and it is imperative you explain that to your potential advertiser. It isn’t a billboard and it isn’t a newspaper article. It is way more targeted and you can get the numbers of how many of those people are listening to your show every day. There is enough information available on the internet. It is the ability to sieve through that information and pull out action items that is the difficult part. That is why, when someone has done it, just like you have, you can help others who would like to “do it” as well. Whether it is teach them to create their own podcast or create an event that has been a huge success. If you are already a coach or mentor, and you don’t have a podcast yet – you should get one yesterday. The advantage of having a great podcast is the ability to create products that your listeners want. It is all in the engagement, and you better make sure you find follow the steps to arrive at that engagement. But, you have the ability to instantaneously make products that your people want – which puts money in the bank straight away. The next step is to improve on that product, but make sure you get a minimal viable product to the market as soon as you can cement that that is what they want. If you haven’t heard about Patreon, it is time you do. Patreon is a brilliant service that allows “your people” to support your creations. The service homepage has the words spread across in bold – “Be a Patron of the Arts – Support and engage with the creators you love.” In every episode you can ask your listeners to support you through the smallest of contributions to help you achieve whatever goal it is that you’ve set out to do. Couple that with a crowdfunding campaign and you are onto a winner. When you create a podcast with a following, hopefully you have followed the 7 steps I wrote about before. If that is the case, then you will know what your listeners’ problems are. If creating a product that will make their lives easier is going to take you time (Item #3), then just use someone else’s product and pull in a referral fee. These days this is so easy to setup with the tools available, so you should have money in the bank sooner rather than later. The common saying of “it isn’t about what you know, but who you know”, is kinda skewed in my opinion. It is about what you know and it is about who you tell that to. The influential connections that you can make by having a podcast has got to be up there amongst the biggest advantages. You can always let these influential connections be an affiliate for your product to get money in the bank. Or, you can work with them to get a new product out. Or, you can be featured on their show. It is the time of the connection economy, make sure you are playing to win. Having a podcast is a brilliant platform to allow you to get on stage and create a business out of speaking. There are so many big time public speakers that started off with a podcast. It is the ability to think on your feet and produce coherent sentences that make you great on stage. Use a podcast to create your speakers’ profile and market yourself. Apart from the money, your time is an important factor of your ROI. 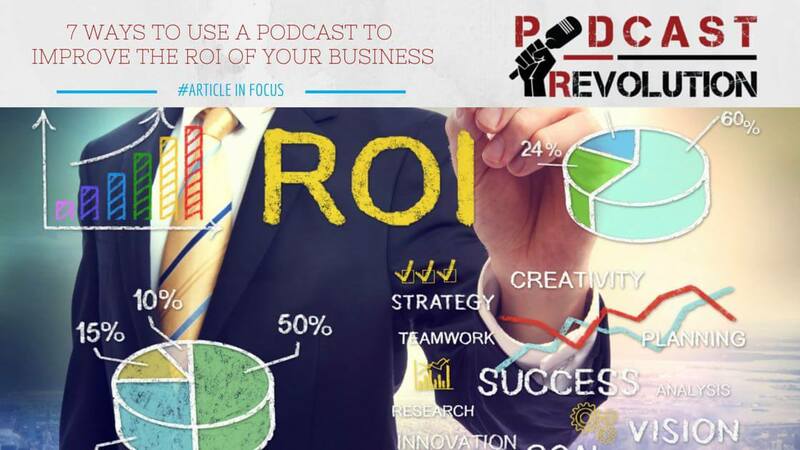 Make sure you pay attention to how much time you and your team are spending on your podcast. Factor all that into the equation.